Shamanism is an ancient healing tradition and moreover, a way of life. It is a way to connect with nature and all of creation. The Shaman (or Sunset Sage as some call him) was created with a wet in wet process, using alcohol inks on reclaimed packaging. Why reclaimed packaging? Simply, because I believe we do not fully utilize our resources. 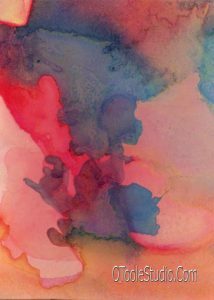 Alcohol ink, because to me the result of the process is effective in depth, color, and the serene energy conveyed. The image is an abstract impressionistic representation of both a sunset on a day with high clouds, and a spirit warrior creating a sand painting in the sky. This painting is available in a limited edition of 25 prints reproduced on 16″ x 20″ acrylic panels. For more information on purchasing one or more of these prints follow THIS LINK.